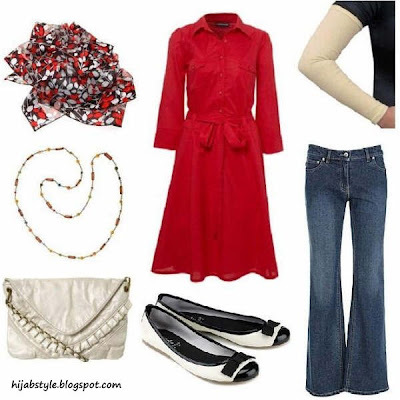 Red shirt dress £45, Warehouse; Fairtrade jeans £45, Monsoon; cotton arm sleeves £1.92-£2.40, Hijab Al-Muminat; scarf £5.99, Scarf World; cross-body bag £12, Miss Selfridge; bead necklace £8, Miss Selfridge; toe-cap pumps £20, Accessorize. Lovely outfit.I thought the dress was long sleeves:)(I got too excited) until I read the description. On the picture It doesn't look like 3/4, does it?. salam i love red, and this looks really nice. would be a great evenng outfit for a casual meeting in a cafe with friends and family. Thanks everyone! Anon 2, yeah unfortunately, which was why I put in the arm sleeves - instant fix! what a perfect shirt dress, love it. ohhh btw quick question, do you think there is an alternative to these tight arm sleeves, the ones i've come across up until now are really tight. i was wondering if i could get similar ones which were a little more flowy with maybe bell sleeves or something similar.... any ideas? I know this sounds kind of corny, but new legwarmers can work as the arm sleeves, but I wouldn't recommend them for the summer. Fatima, I haven't come across any, but if I do I'll post them inshallah. Sara, yeah you could use those, but like you said, too hot for summer!